“Tugs, ferries, and short-sea transport, these are all classes of vessels that we believe would be suitable for completely autonomous operations, monitored by a land based crew, who get to go home every night,” says Kevin Daffey, Rolls-Royce’s director of marine engineering and technology. Suitable, because they all currently rely on humans who demand to be paid—and can make costly mistakes. Over the past decade, there have been more than 1,000 total losses of large ships, and at least 70 percent of those resulted from human error. The argument looks a lot like the one for self-driving cars: Machines stay sober and focused, beat out human reaction times, and can look in every direction at once. Get their programming right, and they should crash less than humans do. Moreover, the economic case for automating shipping is clear: About 100,000 large vessels are currently sailing the world’s oceans, and the amount of cargo they carry is projected to grow around 4 percent a year, according to the United Nations Conference on Trade and Development. Beyond preventing accidents, human-free ships could be 15 percent more efficient to run, because they don’t need energy-gobbling life support systems, doing things like heating, cooking, and lugging drinking water along for the ride. The ship’s sensors are similar to those you’d find on your neighborhood self-driving car, with a few important changes. Their cameras have to provide enough information to identify small objects on the horizon, which means they need a higher pixel count for better resolution, which means more data to sort through. “It’s a terabyte of data a day,” Daffey says. 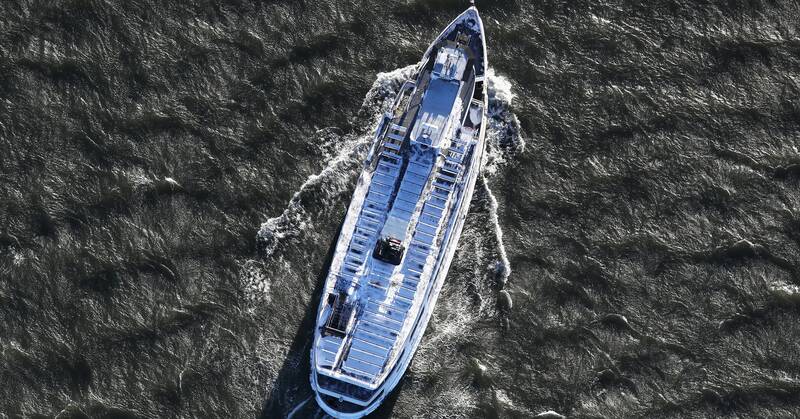 That requires a huge amount of processing power, so Rolls is working with Intel to install server rooms on its vessels. The sensors generate a staggering amount of data. All of it’s stored onboard and uploaded to the cloud once per month, when the ships dock. Rolls isn’t the only company looking to take the humans off the high seas. Buffalo Automation, a startup with close ties to the University of Buffalo in New York, has developed a system that can control ships up to 800 feet long, and has been testing it on the Cuyahoga River in Cleveland. Meanwhile, the International Maritime Organization is only just starting to consider new rules and permissions for autonomy, which makes sailing across international jurisdictions tricky. Some ships, like those carrying hazardous cargo, may never go people-free, Daffey says, but that leaves plenty of market share. Previous PostPrevious Di Maio: "Taglio di un miliardo a pensioni d'oro"